One of the most rewarding parts of being involved with Encore Orchestral Strings is the long-term relationships we have with several renowned luthiers. I first contacted Larry Wilke back in 2007 and our friendship has grown ever since. 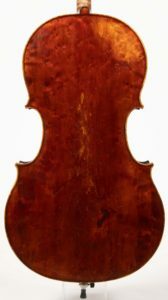 Over the years, we’ve represented and sold many of Larry’s cellos and several of them have gone to musicians here in central Indiana. We had the pleasure of hosting Larry for a short visit last week and one of the events we always try to plan is a dinner with local Wilke owners. This past Tuesday three local musicians who own Wilke cellos were able to come over along with many other cello friends. Larry brought one of his most recently completed cellos along so we had a total of four of his cellos in my basement for people to play. Thai takeout, paper plates, beer from the bottle…informal, but so much fun! If we have more time to plan the next time he visits, I’d like to hold a similar event at the store so that as many people as possible can experience his world-class instruments!